Scientists, fishermen and the environmental community are applauding this month’s release of a draft National Ocean Policy Implementation Plan by the National Ocean Council and the Obama administration. The plan, released last week, lays out more than 56 actions the federal government will take to improve the health of the nation’s oceans, coasts and Great Lakes. Among other things, the draft calls for strengthening and integrating the nation’s network of ocean observing systems, sensors, data collection and management and mapping capabilities into a single national system, and integrating that system with international efforts. The council has already established http://www.data.gov/ocean as a prototype of the kind tool that could make information easily available to everyone from scientists and policymakers to teachers and their students. Integrated information systems and ecosystem-based management were among the high-priority tools suggested by the West Coast Regional Ocean Research and Information Plan, developed in 2009 by Oregon Sea Grant and four other West Coast Sea Grant programs at the behest of the National Oceanic and Atmospheric Administration. WASHINGTON, D.C. – The National Oceanic and Atmospheric Administration is inviting public comments on its new draft scientific integrity policy. The policy incorporates the principles of scientific integrity contained in guidance from the White House, and addresses how NOAA ensures quality science in its practices and policies and promotes a culture of transparency, integrity and ethical behavior. The draft document is available on the agency’s Website for public comment through Aug. 15. The policy contains the principles articulated in President Obama’s March 9, 2009, memorandum and further guidance provided by White House Office of Science and Technology Policy Director John Holdren. PORTLAND, OR – Members of the National Ocean Council will convene at Portland State University on July 1 for the last stop in their “regional listening sessions” tour of the US. Experts from the Council’s 27 Federal agencies and offices have been busy drafting strategic action plans to achieve nine national priority objectives that address some of the most pressing challenges facing our ocean, coasts, and Great Lakes. Having already received solicited and received initial comments on the plans, the council is asking for citizen comments on the strategic action plan outlines they have developed. The Portland stop is the last of a dozen public listening sessions designed to gather further comments on the plans while they are still in the draft stage. The session will take place at PSU’s University Place, 310 SW Lincoln Street. The PSU meeting, which will be chaired by NOAA administrator Jane Lubchenco, runs from 9-11 am on July 1; those interested in attending are asked to preregister online. A new video is available documenting part of the public dissection of a 12-foot great white shark that was featured in an earlier blog post. The shark died after becoming entangled in the ropes of a crab pot, but the shark’s death may mean educational benefits to scientists. The 2-minute video is a time-lapse sequence showing the fin removal portion of the necropsy. A 12-foot white shark—popularly known as a great white shark—that died in August after becoming entangled in the ropes of a crab pot, will become the focus of scientists this week during its dissection at Oregon State University’s Hatfield Marine Science Center. The public is invited to view the necropsy, which will be performed over two days. 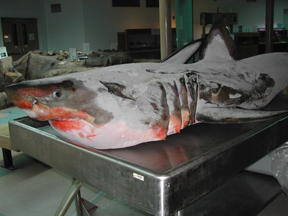 Hanshumaker, who also is a faculty member for Sea Grant Extension at OSU, will remove the shark from the freezer today (Thursday, October 1, 2009) and put it on public display in a roped-off section of the HMSC’s Visitor’s Center beginning at 10 a.m. Visitors may observe the shark via video camera in the Hennings Auditorium—including necropsy activities, which begin late this afternoon. At 4:30 p.m. today, Dr. Brion Benninger, of the Neurological Sciences Institute at Oregon Health & Science University, will remove the shark’s spinal accessory nerve, where it will be used in OHSU neurological studies. Tomorrow (Friday, October 2) a series of procedures is planned. Wade Smith, a doctoral student at OSU specializing in shark studies, will conduct measurements of the shark beginning at 11 a.m., and discuss his findings with a fishery biology class taught by OSU professor Scott Heppell. At 1 p.m., OSU students from two classes will examine the shark and hear experts present information on shark diversity, the white shark’s biology and movements, its unique features, and conservation issues. At 2 p.m., Tim Miller-Morgan of OSU will examine the shark for external parasites, and at 2:30 p.m., Hanshumaker will measure the animal’s teeth and bite impression. At 3 p.m., Smith will conclude the dissection by collecting biological materials, the vertebra, muscle tissue, the dorsal fin and teeth—all of which have scientific value. Samples from the white shark will be sent to: Stanford’s Hopkins Marine Station; Alaska Department of Fish and Game; University of California-Santa Cruz; California State University-Long Beach; Monterey Bay Aquarium; and Nova Southeastern University. The samples will provide data for studies ranging from genetics to toxicology, to age and growth data. The report, developed by Sea Grant programs in Oregon, Washington and California after extensive public involvement, is available for download in .pdf format, along with background documents including more than 5,000 marine research and information recommendations made by stakeholders in public meetings and on line.